Lobster traps sit stacked on the Casco Bay Bridge abutment in South Portland on Wednesday, Nov. 21, 2012, with Portland's waterfront behind them. The greater Portland metro area now counts for more than half the state's economic output. A fishing boat steams into Portland harbor Wednesday, Nov. 21, 2012, with the city skyline behind it. The greater Portland metro area now counts for more than half the state's economic output. 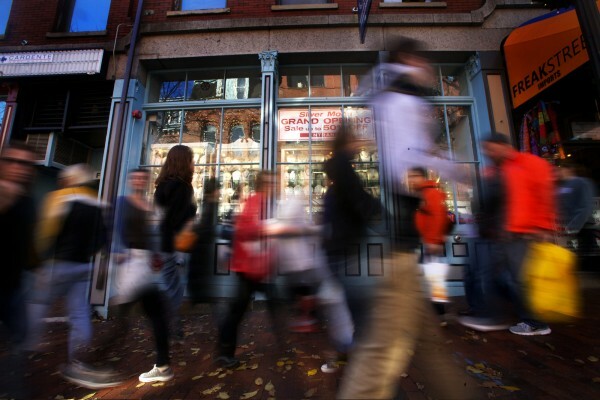 Shoppers throng on Exchange Street in Portland Friday, Nov. 23, 2012, in this time-lapse photo. The greater Portland metro area now counts for more than half the state's economic output. While conceding Portland’s geographic advantage, economists say Maine’s largest city offers lessons for other parts of the state. The Greater Portland metro area — the U.S. Bureau of Economic Analysis defines the Portland Metropolitan Statistical Area as Cumberland, York and Sagadahoc counties — has grown in the last few years to represent more than 50 percent of the state’s total gross domestic product, the bureau says. It’s also one of the 100 largest metro areas in the country, according to the Brookings Institution. To compare, Bangor’s MSA (Penobscot County) in 2010 represented roughly 10.9 percent of the state’s total GDP and the Lewiston/Auburn MSA (Androscoggin County) represented roughly 7.6 percent of the total. While it’s standard for metropolitan areas like Boston, New York City and Chicago to dominate their respective state economies, having a relatively small metro area such as Portland controlling more than half its state’s economy is not common, nor is it necessarily healthy, according to Jim Damicis, senior vice president at Camoin Associates, a company that helps states and municipalities with economic development projects. About five years ago, the Portland Regional Chamber of Commerce hired Damicis, who at the time ran his own economic analysis firm in Portland called PolicyOne Research, to compare the Portland metro area with similar areas around the country, such as Asheville, N.C.; Chattanooga, Tenn.; Manchester, N.H.; and Yakima, Wash. According to Damicis’ findings, Portland has a huge share of the Maine economy compared with other benchmark metro areas in the country. In 2005, Portland’s gross metro product represented 42.7 percent of the state’s GDP, while on average the other benchmark metro regions represented 12.2 percent of their respective statewide totals. The same is seen with employment. Greater Portland provides one-third of all the jobs in the state, according to Glenn Mills, chief economist at the Maine Department of Labor’s Center for Workforce Research and Information. That’s compared with 12.3 percent on average for the national benchmark regions, according to Damicis’ research. Having one metro area generate more than half the state’s GDP is a cause for concern, Damicis said, because it means the state lacks economic diversity. A balanced economy, with several strong, growing metro areas is preferred. Leveraging those assets, wherever they are found, is how Maine will grow its economy in the future, said Katz, who was an author of Charting Maine’s Future, the 2006 report commissioned by GrowSmart Maine. Supporting and leveraging those assets could start in Augusta, but Maine’s Legislature has historically been anti-metro, said Damicis. “State policies have historically been anti-Bangor, anti-Portland, anti-Lewiston-Auburn,” he said. “We need policies that support small- to medium-size metros.” He offered as examples the disapproval of local option sales taxes, education funding and transportation funding. Portland hasn’t always been the economic engine in the state. In the 19th century, given the influence of the forest products industry, Bangor may have had a more vibrant and diverse economy than Portland, according to Charles Colgan, a former Maine state economist and currently a professor of public policy and management at the University of Southern Maine’s Muskie School of Public Service. While Bangor thrived in the post-Civil War era along with natural resource-based industries, Portland struggled, particularly because its port declined in importance relative to Boston’s, Colgan said. As late as the 1970s, Portland’s picturesque Old Port that’s now clogged with tourists during the summer was a seedy warren of rundown warehouses. But as automation and mechanization began to diminish the importance of the natural resource-based and manufacturing industries as job providers, the urban areas began to develop and attract service-related industries, such as health care, financial services and law firms. Both Portland and Bangor began revitalizing their downtowns in the ‘70s, laying the ground for the growth of those service industries, but Portland had two advantages, Colgan said. Ninety percent of the state’s population growth in the past decade has been in urban areas, and that includes Bangor, which in the last decade reversed its trend of losing population, Colgan said. In fact, Bangor actually grew its population 6.2 percent between 2000 and 2010, compared with Portland’s 6.1 percent, according to Census figures. And while Portland dominates the state’s economy, the Bangor region’s economic importance as a service center for northern and eastern Maine is unquestionable. Jim McConnon, an economics professor at the University of Maine, helped develop a method to show how successful a community is in attracting dollars from outside its own confines. It’s called the “pull factor,” and is based on total taxable retail sales figures, one of the few sets of data available on the community level. McConnon’s figures show that Bangor and Brewer “pull” more dollars from outside their region compared with Portland and South Portland. 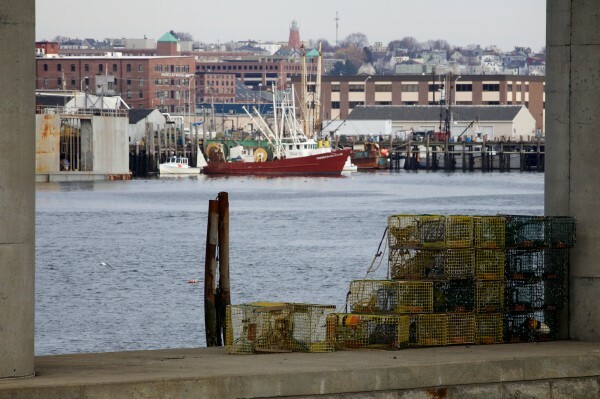 “The challenge for Maine has been how to take advantage of growth opportunities in urban areas and connect the rural areas to urban growth in ways that would keep rural economies vibrant,” he said. Portland’s current economic dominance in Maine may be less important, the economists agree, than the way other regions of the state develop around their own metro areas. Colgan, for instance, points out that Greater Bangor — with UMaine, The Jackson Laboratory and Eastern Maine Healthcare Systems — has a large advantage in its research and development capabilities relative to those in the Portland area and USM. If, for example, some innovative technology with worldwide appeal came out of UMaine, it could grow Bangor into an economic powerhouse. “That’s a conceivable future,” he said. After all, San Jose was a sleepy little town before the influence of Stanford University turned the area into Silicon Valley.